Nothing has changed the possibilities of modern dentistry in recent years as much as dental implants. Screw-like aids made of titanium serve as artificial tooth roots. They enable firm, new teeth in almost all cases. A crown supplements the implant to form the new artificial tooth. How can teeth be implanted? 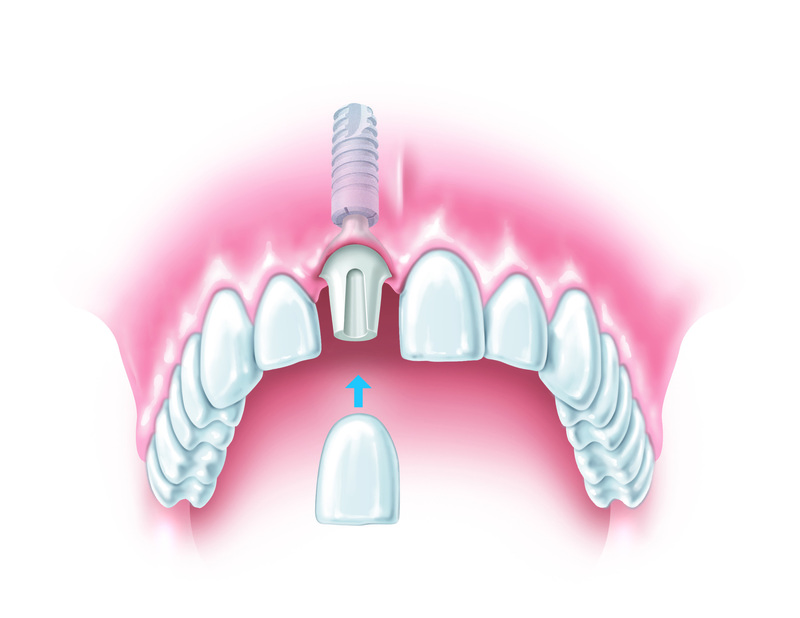 Dental implants can be imagined as artificial tooth roots that are inserted directly into the edentulous jawbone. Modern implants consist of three parts: the implant body anchored in the bone, the neck part (abutment) and the crown attached to it. In order to successfully insert an implant, a number of conditions must be met: On the one hand, it must be surrounded by vital bone tissue and be able to grow in, on the other hand, it must permanently withstand the stresses during chewing. After a certain healing period (3-4 months), the implant should have grown firmly in the bone and thus gained maximum stability under chewing load. This state is called osseointegration. Implants must meet special requirements for biocompatibility, loading capacity and osseointegration. In our practice, we only use materials that perfectly meet these requirements, namely titanium and ceramics (zirconium oxide ceramics). The video shows how an implant is also possible with a tooth that has been missing for a long time due to bone augmentation. We begin with a comprehensive anamnesis. We pay particular attention to the patient’s medication and known previous illnesses. This is followed by an examination of the mucous membrane, the dental situation and the area to be implanted. X-rays supplement this examination and provide information about the jaw bone and the neighboring structures to be considered (such as nerves or maxillary sinus). Finally, an impression (or a 3D scan) of the affected jaw region is made and the further procedure is discussed. In the Praxis am Kureck, each implant is planned in great detail on the computer, including size and position. We also check whether enough jaw bone is available or whether additional bone needs to be built up. 3D planning allows a more precise assessment and thus comprehensive protection of sensitive areas of the jaw (e.g. nerve pathways and maxillary sinus). Any bone augmentation that may be necessary may be avoided because the existing bone is better utilized. The 3D planning thus offers the patient maximum safety and provides a very precise implant positioning. Individual x-ray images of the jaw are taken with a three-dimensional X-ray scanner. These individual images are combined by a computer program to form a complete image. The jaw can then be seen on the monitor as a 3D image. Using special planning software, the implant is now inserted virtually on the computer and a three-dimensional template is produced on a 3D printer. The previous intensive planning significantly shortens the actual operating time. The insertion is normally a small, uncomplicated surgical procedure performed under local anesthesia. If necessary, the bone is built up with bone substitute material or the patient’s own bone or the maxillary sinus is lifted with a minimally invasive procedure. Major procedures can also be performed under general anaesthesia (by our anaesthetist) or under slight nitrous oxide sedation. In special cases, two-part implants are also possible. New teeth also need care! 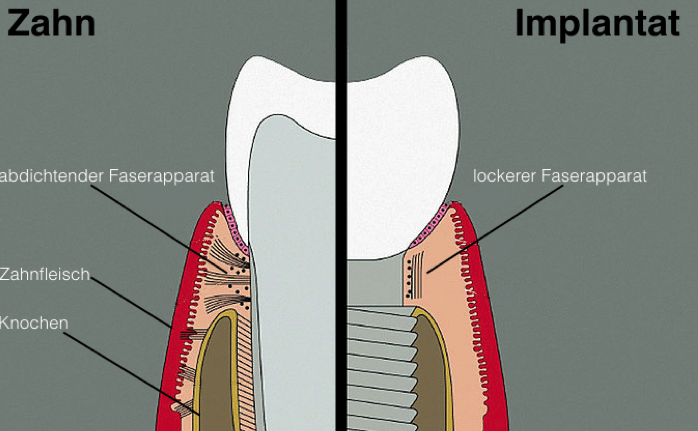 Normally there is no difference between an implant and a natural tooth. But you can see it under the microscope: on the gums! 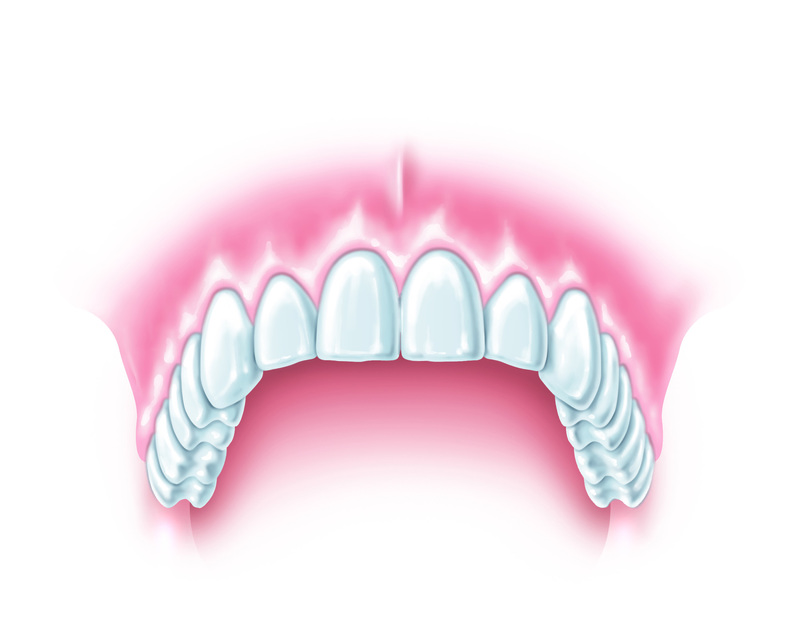 In a real tooth, the gums are firmly bonded to the tooth surface and seal the root against bacteria. These important fibres are missing in an implant. Since no fibre tensions from the gums can grow together with the implant and the crown, the gums are not as close to the implant crown as with a natural tooth. That is why implant patients must pay special attention to this interface between implant and gums. Regular cleaning is necessary to prevent inflammation, which in the worst case can even lead to bone resorption around the implant. “Peri-implantitis” is the scientific term for this inflammatory disease. The insidious thing about it is that it remains undetected for a long time because the pain is missing. As a rule, it only begins when considerable damage has already occurred. In the worst case, loss of the implant is the result. And now the good news: recent studies show that the risk can be reduced by more than half if you take regular control and prophylaxis appointments. The practice at the Kureck in Wiesbaden offers you a well-trained prophylaxis team that professionally cleans and keeps your teeth in shape. Use this opportunity to enjoy your teeth for a long time to come! Just give us a call! (0611-990370) We are there for you almost every day for 14 hours from Monday to Saturday! Source: Costa, F.O., Takenaka-Martinez, S., Cota, L.O. M., Ferreira, S. D., Silva, G. L. M., & Costa, J. E. (2012). Peri-implant disease in subjects with and without preventive maintenance: a 5-year follow-up. Journal of clinical periodontology, 39(2), 173-181.